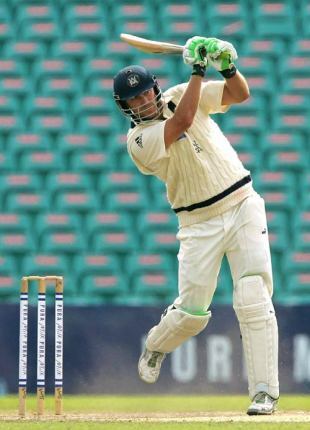 The opener Nick Jewell's half-century helped Victoria to 3 for 228 against Western Australia on a day disrupted by rain in Perth. Jewell wasn't expecting to play much for Victoria this summer as he concentrated on his coaching career, but he was a late call-up to replace the injured Chris Rogers and showed he still had the batting form. Jewell, who knocked back a state contract in the off-season, opened with a useful 74 that provided a base for the Bushrangers. Dropped on 10 by Adam Voges, Jewell took advantage and put on 113 with Michael Hill, who fell to the debutant Ryan Duffield on 47. David Hussey also became the maiden victim of Michael Beer, the spinner who moved from Victoria during the winter. Hussey edged trying to cut and was out for 43 just before the players left the field for a second rain interruption. Aaron Finch (35) and Andrew McDonald (9) were not out when more rain and bad light cut the day to 67 overs.